Jan Hickey, Claude Leroy, Jackie Hugo, Bonnie Grob, Sandy Meinholz, Kathy Seals. We welcome the new President and Directors, and thank those returning for their dedication. Also, a big THANK YOU to Gene Woehler, who stepped down from the Board of Directors after many, many years of service to MACAW as President, Treasurer, and Board member. MACAW is what it is because of your dedication and years of service, as well as your advice and experience, which continue to be welcome and valued. Thank you, Gene. Happy New Year and welcome to the January issue of the MACAW Flyer! I hope everyone had a safe, healthy and happy holidays. I for one am glad the holiday rush is behind us and happy to see the malls returning to normal. Never fear, the next Christmas season will start sooner than you think! For those of you who couldn't make it to our annual meeting last month, we had a lot of fun and we missed you! While listening to Christmas music we ate a great sampling of foods, dips, casseroles and desserts and then drank all of Ruth's world famous hot apple cider. 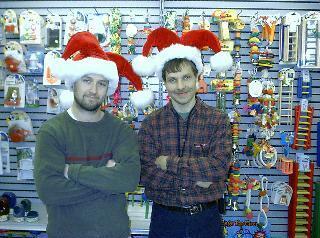 Afterwards, we made bird toys for the Humane Society and socialized. We had a welcome visit from Dr. Paré who stopped in to wish all of us a Happy Holidays. Ted, Joe and Joe's wife from MADCAT Pet Supplies joined us and donated additional items for our raffle and brought in more food and sodas for the party. Hagen donated boxes of bird food and free samples for everyone to take. Just about everyone who entered the raffle won something. Please be sure to look at our thank you letter to all the companies and individuals making donations to this years holiday raffle. Without their generosity, we couldn't have had this raffle. The elections were held during the party and I was elected the new President of our great bird club. As such I must say that it is truly an honor to sit on this high perch. Many thanks to Jackie, the 2002 Board, and all the 2002 elected officers for a job well done last year. Thank you! Welcome newly elected board members and 2003 elected officers! I look forward to working with you. Start rolling up your sleeves, sharpen your pencils, we have some work to do! Here is a little information on me for those who may not know who I am. My wife Paula and I have been members of MACAW for several years. In that time we have both served on the board. Paula continues to do a great job behind the scenes as your Education Director, looking for interesting speakers to invite and future behind the scenes tour possibilities. We have two cockatiels and 12 zebra finches. We came to know MACAW through the annual MACAW Bird Fair where we also first volunteered our time and energy to this fun and worthwhile event. One of my interests is airplanes, so one week out of the year I spend time up at Oshkosh watching airplanes fly, the other 51 weeks of the year I watch birds. I hold a private pilot license and admire all flying machines! Birds are quite remarkable flying machines and excellent stunt pilots that can still out fly the best of us. This year MACAW will be celebrating its 20 year anniversary. In 1983, MACAW started out with just a few people interested in getting together to discuss birds and to share their knowledge and experience with one another. 20 years later, we haven't changed much, we still gather and help one another. Yes we have grown in size and meet in a bigger room now, but we remain just as personal and helpful as the people who started MACAW 20 years ago. In addition, MACAW has raised many thousands of dollars for hundreds of worthy causes throughout the years in an ongoing effort to help the avian community. Yes, MACAW has and continues to make a difference in the avian community and to its members. It truly is a great and wonderful bird club. Please join me in wishing MACAW A Happy 20th Anniversary! Celebrate this occasion by renewing your membership in MACAW and supporting our club in any way you can. We are always in need of volunteers, fresh ideas and your support in seminars, fairs, and raffles. If you don't know what to volunteer for, just meet with me at our meeting or email me, I'm sure there is a fun and worthy opportunity just for you. I see a challenging year ahead for MACAW in 2003. Since 9/11, our funds, attendance in MACAW events and monthly meetings have been very low. For MACAW to continue serving the avian community, we must rise to this challenge and look for new ways to get people involved in MACAW, find new ways to attract new members, find new ways to make MACAW fun and entertaining for everyone. I am asking for everyone to send me their ideas and suggestions. No idea is too small. Speaking of attracting new members, we started a new MACAW web page at Madison.com, with links back to our main site. Both MACAW web sites will contain new and updated information. Madison.com will give us free help promoting our seminars and help MACAW become more visible in the community. We are also trying to start our Adopt A Highway project and looking for just one more volunteer. In an effort to attract more members to our monthly meetings and make them more fun we might start making bird toys. I'm interested in hearing your feedback on this. Also, every month I will give away 1 scratch off lottery ticket to one random member attending that meeting. A winning ticket could be worth anywhere from a few hundred to a few thousand dollars! To be eligible for the drawing you just need to be present. The meetings are always interesting and fun, and we will be looking to make them even better, and now you can also have a chance to win a little money for birdie expenses! In an effort to improve communications between you and me, I have started a new free email newsletter called the MACAW Insider. Through this email, you are informed of timely information, gossip, rumors and where you are asked for feedback. To sign up, just send me an email at stevenf@charter.net and you will get on the list. As always your email address will only be used for MACAW communications. In the future we may try to send our MACAW Flyer out this way to you. I now invite you to read through our January flyer. Our Editor Christene worked overtime getting this flyer out, it is packed with information. We have articles on upcoming events, MADCAT Pet Supplies 10% offer to you, our Ask The Vet article and much more! Also, please keep May 3rd open for our upcoming bird seminar. Better yet, volunteer for it! Thank you and may you have a great year ahead! Last Chance to Save the Great Green Macaw? Scientists say we are losing species at an alarming and unprecedented rate. A number of parrot and other bird species are also bound to become casualties unless we act -- and fast. One of the parrot species in extreme danger of becoming extinct is the Great Green Macaw, a majestic creature whose habitats are in Costa Rica. The good news is that there are organizations and individuals dedicated to the protection of this species. On January 12th, we will have the pleasure of learning about the efforts of Friends of the Great Green Macaw, a group based in Madison, that does conservation work in Costa Rica. Aside from discussing behavior, habitat and status of the Great Green Macaw, our presenter Bobbie Webster, will explain other relevant topics, such as how her organization fits into current conservation efforts. You can learn more about Friends of the Great Green Macaw by visiting their website at http://www.greatgreenmacaw.org . Every month MACAW members are invited to send in questions to ask the vet. This month we selected a question sent in by Ruth Gundlach. Ruth asked about fatty liver. We asked Dr. Paré, DMV and Assistant Professor at UW School of Veterinary Medicine if he would help us with this by explaining what fatty liver is. Thank you Ruth for an excellent question and also our thanks to Dr. Paré for helping us understand what fatty liver is. And now, it gives me a great honor to introduce you to this month's Ask The Vet doctor, here is Dr. Jean A. Paré. Question: What is fatty liver, and what does it mean if my bird is diagnosed with this condition? Fatty liver is an umbrella term for a condition brought on by a number of different causes. Fatty liver usually referred to in medical terms as hepatic lipidosis. It is a relatively common condition in cats, and we also see it in ferrets and hedgehogs. In pet birds, we see comparatively fewer cases, but it may be that many birds with hepatic lipidosis go undiagnosed. Fatty liver is not a disease, as much as it is a symptom or lesion, and unfortunately is often a diagnosis established at necropsy. It is a result of abnormal fat mobilization by the body, often subsequent to inadequate caloric intake or sudden food deprivation. It can also be a result of long term excess fat in the diet or, more rarely, some congenital or acquired metabolic or endocrine (thyroid, adrenal, pancreatic) disorder, toxins, or other causes. Fatty liver consists of excess accumulation of microscopic fat droplets in the liver cells (hepatocytes). Diffusely, the hepatocytes become engorged with one or many of these fat droplets. The net result is that once there is sufficient accumulation of fat droplets in the liver cells, hepatocellular function is altered. Since liver cell function is fundamental to basal metabolism, a number of basic metabolic processes become impaired. The swelling of hepatocytes may also cause the obstruction of small bile ducts and cause biliary stasis and maldigestion. The term fatty liver is also applied loosely to some normal, or physiologic, storage or synthesis of lipoproteins in hepatocytes, such as vitellogenin (yolk protein) when a hen is in lay. In poultry operations, it is a common condition of commercial egg layers. In pet birds however, fatty liver is less common, especially true hepatic lipidosis. There are two main clinical syndromes: one seen in the larger psittacine species, especially in overweight individuals, that suddenly undergo fasting for whatever reason (sudden change of food, food shortage, etc,). This sudden lack of caloric intake triggers the body to mobilize internal fat (e.g. in the mesentery) for energy. The end result of the fat catabolism is energy, but not without the production of some noxious byproducts of fat breakdown, such as ketones. Ketone accumulation in the blood, termed ketonemia, is enough to cause the bird to feel sick, further compounding the inappetence, and we have a vicious cycle that may well end up in death. A second clinical syndrome is that of a bird that is on a high-fat diet for a prolonged period of time. The fat accumulation in the liver over time (month, years), hampers liver function and leads to progressive liver insufficiency. Such birds may bleed easily because the liver no longer synthesizes sufficient amounts of coagulation factors. The same psittacine species seem more at risk. By the way, "pâté de foie gras" is a delicacy (for some, certainly not for me!) that is truly the fatty liver of a goose, as awful as it may sound. Think about it next time you eat some! A fatty liver will therefore grossly (macroscopically) appear swollen and brownish to yellowish, instead of the normal brick red color, and will float in formaldehyde rather than sink to the bottom of the jar, because of the increased fat content. A fatty liver is also greasy in texture and more friable, and can potentially rupture (liver fracture) following relatively minor trauma. Liver fractures occur rarely with fatty liver, but when they do, hemorrhage is often fatal. A diagnosis of fatty liver can be made ante-mortem, and is based heavily on the history, a good physical examination, and on ancillary diagnostic tests. On physical examination, the liver may rarely be palpable beyond the caudal edge of the sternal plate. Feces may be voluminous and grayish or may be scarce if the bird is not eating. Birds with fatty liver tend to be overweight, and are actually often obese. Amazons, African greys and some cockatoos are more at risk, but we do see this condition with regularity in budgerigars or cockatiels. Bloodwork is essential to document ongoing hepatic damage. Typically, the liver enzyme serum level will be slightly to moderately elevated. Cholesterol is usually high. Bile acids may also be elevated, reflecting some degree of liver insufficiency. Radiographs will demonstrate an enlarged liver silhouette and the presence of ample abdominal fat, and ultrasound will reveal diffuse hyperechogenicity of the liver. All of these tests can lead to a presumptive diagnosis of fatty liver, but a definitive diagnosis can only be established through a liver biopsy. Either an ultrasound-guided fine needle aspirate, or a biopsy via laparascopy (with an endoscope) or via coeliotomy (surgery), will assist in the diagnosis. Treatment obviously depends on the cause, and may be in the form of hospitalization and nutritional support (tube gavage), or in other cases, adjusting the diet to a more balanced one, but the ideal approach to fatty liver is PREVENTION: have your bird eat a nutritionally balanced diet, preferably a proven commercial palletized ration, supplemented with vegetables and fruits. Minimize the amount of, or even exclude fatty seeds such as sunflower and safflower seeds. Promote exercise for your bird, and avoid obesity. Ensure that your bird is never subjected to any sudden and prolonged fasting period, especially if your feathered friend is too plump for its own good. Thank you Dr. Paré! If you have a bird that you would like to bring in and be seen by this world respected vet school and animal hospital, please call 263-7600 to schedule an appointment. MADCAT Pet Supplies Offers MACAW Members 10% Off All Bird Supply Purchases! Madison has a new pet store in town! MADCAT Pet Supplies, located at 7820 Mineral Point Rd, Madison, WI 53717; Telephone 608-833-5800 (formerly known as Pet Plus) on the West Side and 1012 Williamson St. on the East Side. Ted O'Donnell and Joe Kazda are the new owners and they have quickly taken a liking to our MACAW Bird Club. In addition to helping us by passing out MACAW membership applications at their stores, giving you the MACAW member a 10% discount on all your bird supply purchases, they have also both attended several MACAW member meetings, and donated a table of raffle prizes and brought food and drink to our holiday party and even joined in the fun of making bird toys for the Humane Society. I highly encourage everyone to support this business that supports MACAW whenever possible and save yourself some money too with that 10% discount! To take advantage of this discount, just tell the cashier that you are a MACAW member. MADCAT carries all the popular brands of pellet foods and seeds from Sunseed to Kaytee to Browns and can special order anything they don't carry upon request. They also offer special bulk pricing to breeders and bulk buyers. MADCAT sells a large assortment of vitamins, treats, toys, activity centers, and bird cages, including the big California cages. They will even deliver the big cage to your home for free on top of that 10% discount! Ted says he's not interested in selling live animals, but he is serious about helping you care for the ones that you do have in a very helpful and friendly way. MADCAT also sells various other pet supplies for dogs, cats, fish, and you name it. They also collect donations for the Dane County Humane Society and are active working with shelters and sanctuaries in the community. Please join me in welcoming MADCAT to Madison and wishing them much success in their new business! Introduce yourselves to Ted and Joe, tell them Steve sent you and says hello too! The following birds are ready and waiting for loving homes: 8 young male budgies, 6 young female budgies, and a female cockatiel. Can you donate any of the following? : Paper towels, antiseptic wipes, corn cob bedding, old towels, spray bottles, Kaytee Rainbow diet for parrots, Kaytee parakeet food, Zupreem Fruit Blend for parrots, treats, toys, cotton rope (for making toys), and Nutriberries (any flavors). If you could spare any time at all, the shelter could use your help. To learn about volunteer opportunities, please contact Mandi Falk at extension 115. February 9th - Stanley Temple, PhD, of the UW-Madison Wildlife Ecology Department. Visit him online at http://wildlife.wisc.edu/faculty/temple/temple.htm . Topic: To be announced. March 9th - Naya Brangenberg, of the UW-Madison Veterinary Medical School. Topic: Research involving the endangered Kakapo parrot of New Zealand. April 13th - Allison Shreve and Maria Verbrugge, students at the UW-Madison Veterinary Medical School, and this year's externship recipients. May 3rd (Saturday) - Our seminar, which will be held at the Dane County Humane Society. Board meeting starts at 1:00. All MACAW members are welcome to attend board meetings. Hospitality break is at 2:00 pm. Speaker is at 2:30 pm. M.A.C.A.W. meetings are held the second Sunday of the month (excluding June, July, & August).